If you use your credit card outside the United States, your credit card company will probably charge you a foreign transaction fee. A foreign transaction fee is a small service fee, usually 1-5% if your card charges the fee, charged by the credit card issuer and the processor (Visa, MasterCard, etc.) to convert your purchases from US Dollars to the local currency. A credit card company is required by law to disclose this fee and will usually itemize it on your credit card statement, along with the exchange rate they use in the conversion. 1-5% may not seem like a lot, a fair fee to do the conversion and certainly beats currency exchange booths in airports, but 1-5% can add up, especially if you rely on your credit card a lot. 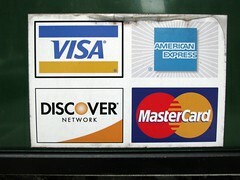 When we travel, we try to use credit cards as frequently as possible. Using credit cards abroad can protect us against fraud and we won’t need to carry as much money, which is safer for us anyway. Not every card issuer charges a foreign transaction fee. In fact, some will actually cover the foreign transaction fee charged by Visa and MasterCard.. Visa and MasterCard will charge you 1%, so any issuer that charges 0% is actually paying that 1% to Visa/MC on your behalf. Capital One, my card of choice for international travel, doesn’t charge a foreign transaction fee and does a fantastic job of showing international charges. They will give you the conversion rate, the charge in USD and in local currency, and will do so for every single charge. Schwab Bank’s Invest First Visa is another card that doesn’t charge a foreign transaction fee. Cards that charge 1%: Affinity Federal Credit Union, NASA Federal Credit Union, USAA and Pentagon Federal (PenFed) Credit Union. Cards that charge 2%: American Express and Discover will charge only 2% but acceptance of those cards is very limited overseas, especially Discover. Cards that charge 3%: In general, every other card available will charge you 3% (or more) for a foreign transaction fee including Bank of America, Chase, Citibank, HSBC, SunTrust, PNC, and Wells Fargo. The next time you go abroad, be sure to get a credit card that doesn’t charge a foreign transaction fee.